The Reds cruised to a 36-14 win over the Brumbies to secure their second straight victory in Super Rugby on Sunday. Bryce Hegarty provided 16 points as the Reds moved up to fourth in the Australian Conference courtesy of a convincing win at Suncorp Stadium. Scott Higginbotham, Chris Feauai-Sautia, Tate McDermott, Hegarty and Brandon Paenga-Amosa scored tries for the Reds. Higginbotham went over from close range in the first half for the Reds, who took a 10-0 lead into half-time. A comfortable bonus-point victory for the Reds, who secure their second Super Rugby win of the year. Henry Speight, on his 31st birthday, scored in the corner shortly after the break to bring the Brumbies back into the game. However, converted tries from Feauai-Sautia and McDermott helped the Reds pull clear before they added to the scoreboard late. 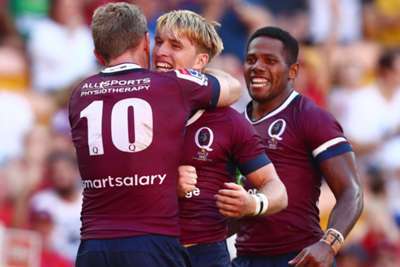 It gave the Reds back-to-back wins after they started the season with three straight losses, leaving them just four points behind conference leaders the Waratahs.